Municipality of Brighton (Lower Tier Northumberland)Record Owner? Log in. Just an 1.5 hours east of Toronto. Take Highway 401, to Highway 30 (exit 509), go south 5 Km. For a more scenic route take old Highway 2 which runs right through the Town and parallel to the 401. Brighton is a town for all seasons, so come and enjoy. Located on the shore of Lake Ontario, with excellent fishing, natural areas, and a quaint downtown, there is much to do. To learn more about our town, tourism, and the area in general go to http://www.town.brighton.on.ca or use the link at the top of this page. The town is filled with Loyalist history, the local Proctor House Museum is housed in a Victorian Mansion that is rumoured to be haunted! Local parks such as Presqu'ile Provincial Park, and Proctor Park offer a variety of natural experiences. Come, let us 'Brighton' your day! Pop. 4,401. 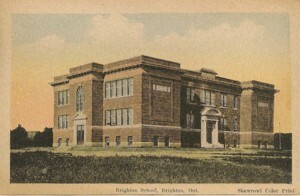 In Brighton T., Northumberland C., on the N shore of L. Ontario and C. Rds. 2, 30 & 64, 32 km SW of Belleville. Settled in 1796 by United Empire Loyalist Obediah Simpson and known as Singleton's Corners, the community was renamed Brighton in 1831, likely after the seaside resort in East Sussex, England. A plaque just south of Brighton off Hwy 2 recalls the loss of the schooner Speedy in 1804. The Speedy sailed from Toronto in October carrying members of the circuit court to attend a murder trial in the Newcastle District. All on board -- including lawyers, witnesses, and the accused -- were drowned when the Speedy foundered off Presqu' ile Point. Have something to say about Municipality of Brighton (Lower Tier Northumberland)?